1.) Today is the day for door ringing and tricker treatin'. All I have to say is make sure your bowl is adequately filled to the brim with candy. Tonight will be a busy Halloween, because it's Friday night, no school for kids tomorrow...more tricker treaters. It won't be brutally cold like it has been the past few nights, but the upper 30's may prompt a few people to take that jacket out of the closet. Tomorrow will be bright and warm with highs in the mid to lower 70's. Fishing should be great this weekend. The cold will be back, so don't get accustomed to seeing 70's.... next weekend we will be back into the low 30's for night. 2.) This year has absolutely flown past me. I think the fact that Christmas is only 2 months away is scary. If I'm not mistaken, Christmas music will start tomorrow on a few radio stations!?!? For some reason, they always start Christmas music WAY to early. The first song played on the first weekend of November last year. 3.) Anywho...fishing isn't bad at all. The trout are attacking anything that remotely looks like a morsel of food. Present a small streamer, or a black stonefly nymph to the fish, and I guarantee you they will be on the end of your fly rod in a heartbeat....as long as you use light tippets, and a stealthy approach to the river. I would fish the pocket water, seams, riffles, and heck...try the slow pools. 4.) More tomorrow...Panthers are off on Sunday with a bye week (which they truly deserve), so we will have to wait until next Sunday when they fly to Oakland to attempt to take another win back to Charlotte. 5.) Election day is Tuesday...Hmmm...Obama or McCain....McCrory or Hagan... I'm glad I'm not 18 just yet, I wouldn't have a clue as to who I would get my vote... more tomorrow. 1.) It has been a very chilly couple of nights here in the Piedmont. The mountains received about 1-3 inches of snow on Monday and Tuesday. Snow is just not supposed to fall in October here in the south...of course it's welcomed, but not normal. Folks up in the Triangle and Triad saw their first few pellets of sleet on Monday. Nothing much, but enough to show what old man Winter has in store for us. I have been studying various 08-09 Winter outlooks, and frankly, Winter does look like it's back. December and then again in February looks to be the best months for cold and snow. Both months show above average precipitation, and below normal temperatures. One guy is mentioning a NC snowstorm somewhere between December 5-12. Only time will tell, but....still interesting for us snow fanatics. 3.) Voting day is fast approaching....PLEASE GO VOTE!!!! EFFECT FROM 11 PM THIS EVENING TO 2 PM EDT TUESDAY. 1.) Here in the Charlotte area, it really hasn't rained a whole lot today. Rain is really confined to eastern NC and Western NC. Not much precip in the middle. Maybe the wedge that is on the east side of the mountains are breaking up the moisture...who knows. 2.) Next week you will be able to say "it's freezing out there" without having to worry about being politically incorrect/correct. Mt. Mitchell, the highest point in North America east of the Black Hills of South Dakota, will see upper teens and low 20's. Weather.com is forecasting 21 for the state park, which isn't completely on the summit of the 6,684 ft mountain, so the peak will likely see anywhere from 19-21 degrees on Monday-Thursday mornings. Here in the Piedmont, lows will make it down to the low to mid 30's. Highs will struggle to hit the 50 degree mark in some places. 3.) Take a look at the website posted below. They are saying the Southeast may receive a decent snowstorm somewhere between December 6-12.....Take a look and see what you think. 2.) I'm glad that rain is on it's way...we need it!! The trout streams are extremely low, and this will change by tomorrow evening. 1-2 inches of rain is enough to substantially boost a river back up to at or above normal stages. Ofcourse, get out on the stream soon, because that water is going to immeditely start dropping after the rain stops. I would use big, gaudy streamers, and large #6-10 black stonefly nymphs. Until the water starts rising, fish the riffles and faster water, with 5-6X tippet. 1.) It has been a fairly decent day here in the NC piedmont. We were in the low 60's for most of the day, and the temps are on their way back down to what is going to be another chilly night, as temperatures will be between 33-36, depending on your location. Everyone in the rural sides of town will likely make it down to the lower end of that 33-36 range mentioned. Tonight, frost will be an issue, with calm winds, and near freezing temps. The next few days will be chilly, with Friday being the coldest. Early Friday morning we will be in the 30's and rain will start to move in. We will only hit about 52-55 on Friday, and as te rain moves in, temps will start to go down once more. Once the precip establishes itself, we will probably be back down into the upper 40's Friday afternoon. With all of this cold air, you may be thinking "when's the snow gonna' start fallin"? Snow may start falling up on the north and west facing slopes late Saturday night....Mostly flurries and light snow showers, but snow nontheless. Key point is the mountains will not experience any "quick, grab the milk and bread," kindof situation. Nothing that the folks up there can't handle. 2.) Nebraska is next in line for Old Man Winter, as they will receive 6-12 inches of snow over the next day or so. I wonder who's next? Every Winter, the snow falls high up in the Absaroka Mountain Range in Montana, works it's way down to Billings, and then spreads into the plains, and eventually to NC by late December. For some reason, I think we will see a decent snowfall around Christmas... or a decent snow year overall, albeit the warm temperatures and lack of rain. Accuweather is predicting a colder and snowier than average Winter for the southeast, and aa few other sources are saying the same thing. NWS Prediction Center is not jumping on the snow and cold bandwagon, but we will have to see. 3.) Bundle up if you are heading to the stream to wet a line. If you do decide to fish, try PT nymphs, small midges, and small dries(adams,BWOs,midges). The trout aren't that picky, so as long as you are stealthy and use that 5-6x tippet, you will be fine. 1.) It was cold here in the Charlotte area. We got down to 33 degrees, when I checked the thermometer at 7 AM. We probably made it to the freezing mark last night as well. Boone dropped to 30 last night, while Asheville went down to 35. Tomorrow will be a few degrees warmer (72), but nothing out of the ordinary. The average first frost for Charlotte is early November, but obviously ma nature couldn't wait another week and a half. 2.) Today is a good day, after the Panthers won yesterday. I'm really glad they took the win. 3.) Fishing hasn't been at it's best here in NC, but you should still have some luck out on the trout stream. The trout are hungry, so really, try what fly you think will work...PT nymphs, Hare's ears, Stonefly nymphs, and so on. We are now getting to that time of year, where nymphs are really the best flies to use, given the cold water. 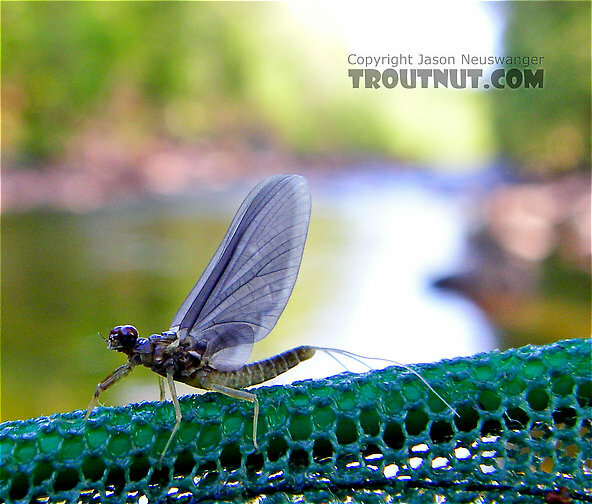 That being said, dries are not completely out of the question, if there are cloudy skies and cool temps...BWO's may hatch out...and the usual midge activity. 5-7x tippet is good, and you generally don't have to beat the early bird, and be on the water at 6 AM...8:45-10:00 is a good starting time due to the cold water. Let the sun reach the surface, and warm the water up a little, before you start fishing. Take a thermometer with you, and take temperatures, and find when the most productive part of the day is. 1.) Man, was it cold last night. 39 was the low. Many places up in the mountains were in the lower 30's. We are going to repeat it over again tonight, as temps are going to plummet to into the lower 30's here in the Charlotte area. A frost advisory is in place tonight until 9:00 tomorrow morning. It would be the first frost of the season here in the Queen City area. I don't think grasshoppers will work up on the trout streams. The hoppers are dead after a few frosts have already hit the mountains. Stick with nymphs and you should do fine. NCZ035>037-056-057-068>072-082-508-SCZ007>009-013-014-192100-/O.CON.KGSP.FR.Y.0008.081020T0400Z-081020T1300Z/ALEXANDER-IREDELL-DAVIE-CATAWBA-ROWAN-CLEVELAND-LINCOLN-GASTON-MECKLENBURG-CABARRUS-UNION NC-GREATER RUTHERFORD-SPARTANBURG-CHEROKEE-YORK-UNION SC-CHESTER-INCLUDING THE CITIES OF...STATESVILLE...MOCKSVILLE...HICKORY...SALISBURY...SHELBY...LINCOLNTON...GASTONIA...CHARLOTTE...CONCORD...MONROE...RUTHERFORD...SPARTANBURG...GAFFNEY...ROCK HILL...UNION...CHESTER910 AM EDT SUN OCT 19 2008...FROST ADVISORY REMAINS IN EFFECT FROM MIDNIGHT TONIGHT TO 9 AMEDT MONDAY...A FROST ADVISORY REMAINS IN EFFECT FROM MIDNIGHT TONIGHT TO 9 AMEDT MONDAY FOR THE WESTERN PIEDMONT AND SOUTHERN FOOTHILLS OFNORTH CAROLINA...AND UPSTATE SOUTH CAROLINA BETWEEN SPARTANBURGAND CHESTER.HIGH PRESSURE WILL BUILD INTO THE REGION TODAY AND REMAIN OVERTHE AREA FOR THE NEXT FEW DAYS. WITH CLEAR SKIES AND CALM WINDS...TEMPERATURES TONIGHT ARE EXPECTED TO FALL INTO THE MID 30S ACROSSMUCH OF THE NORTH CAROLINA PIEDMONT AS WELL AS THE EASTERNPORTIONS OF UPSTATE SOUTH CAROLINA. THIS WILL RESULT INWIDESPREAD FROST...ESPECIALLY IN RURAL AREAS.A FROST ADVISORY MEANS THAT FROST IS POSSIBLE. SENSITIVE OUTDOORPLANTS MAY BE KILLED IF LEFT UNCOVERED. 2.) Off to the Panthers game, more later. I found this on Youtube, and I had to post it. This is great...Mark Mathis was crazy when it came to weather. 1.) Right now the state of NC is experiencing a taste of Winter, as temperatures are down into the 50's today. Here in Kannapolis it is 56, and an hour ago it was 59, so obviously the temps are dropping pretty quick. Up in the mountains some folks are in the mid to upper 40's. Boone is at 47 right now, and it has been in the upper 40's all day up that way. Freeze watches and frost advisories are posted for most of the mountain counties, because Monday morning they are expected to see upper 20's and low 30's. Charlotte and towns surrounding the Queen City will fall into the mid to upper 30's Monday morning....so cold stuff for sure. These kind of temps are average for Christmas time and beyond. I'm ready for the snow, cold, and Winter. We are currently 15 degrees colder than Billings, Montana, where they are at 71! TEMPERATURES IN THE UPPER 20S TO LOW 30S. IN THE VALLEYS ON SUNDAY NIGHT. BE CONFIRMED THAT A WIDESPREAD FREEZE HAS OCCURRED. 2.) I will be at the Panthers-Saints game tomorrow, but I should post after or before the game. 1.) It has been a cold rainy day here in the City of the Looms or as most people call Kannapolis. Right now it is 59 degrees and light rain has been falling all day. I don't think it rained very hard at all today....more like a constant mist. This time the rain doesn't seem to be helping with the low water levels in NC. Rain is still forecasted several times in the next week or two. Temps will be near normal, or in today's case, below normal by a few degrees. 2.) Fishing will improve with the temperatures coming back down, but the low water levels are really the main concern. When a stream's temperature is between 41-59, the pH level is greatly improved, which in turn helps produce the dissolved oxygen that salmonid species need to survive. Anywho... trout will take the same flies listed in the last posts, and on the recommended flies board to the right... copper johns, light cahills, adams...and one exception, BWO adults may hatch due to the cool, dreary day. 6x and 7x are the tippet sizes to shoot for. You may get by with 5x, if a downpour happens, and the stream gets a little muddy...but I wouldn't count on it. 3.) More later or tomorrow. 2.) Fishing is fine, minus the low waters, but overall you should be able to catch a few trout. The key is to fish the fast water, seams, pocket water, riffles, and so on... The fish will be spooky, so use some of that Jim Vincent's RIO, 6x-8x tippet. Small beadhead nymphs and dries as a dropper has been the primary weapon here in NC. Remember to stay low, and wear drab colored clothing, and the fish will more than likely cooperate. Stealth is more important than fly selection, so travel through the water in a silent manner...otherwise the fish will scatter and ...well, game over. The nights are starting to cool off as well as the days, so fishing will improve over the next few days. Rain is also probable in the next few days in a few mountain towns. If we can just get a long term relief from the low water, we would be in prime shape for fly fishing. 3.) Here in the Queen City area, we are really going to be nice and cool, as temps will drop to the lower 60s and upper 50's, with 30's at night. Accuweather's 15 day forecast does not show a single temperature above 71. I think Ma Nature is finally getting her act together. 4.) Not much else to say....more later. 1.) I just noticed the temperature is 76, despite the mid to upper 80's in the Charlotte area. Now, in the Summer, when temperatures are in the upper 90's, it's a major "cool down" to see temps fall down to the 80's. Now that we are a couple of weeks into Fall, even the mid 70's are hot, compared to the normal range of the mid to upper 60's. There is major relief from this last "heat wave", as Friday marks the cool off stage. We will be in the upper 60's on Friday, and lows will dip back to the 40's.........but, we are going to plummet down to the mid to upper 50's as highs on Saturday. Boone will see upper 40's, and low 50's for highs on Saturday. The trout are going to be shocked this weekend with the temperature differences we have experienced over the last few days. Hey, welcome to North Carolina......just wait 'till Winter comes around. The Winter season yields the most uncertainty, because of the ingredients that have to fall in place flawlessly, to have a major snowstorm....which we are due to have this year. I remember back in February 2004, when a foot and a half of the white stuff fell across the western Carolina. Here in Kannapolis, I vaguely remember 19 inches accumulating here in the City of the Looms. Other neighboring towns received a few inches above or below us. Regardless of those triple digit dog days of Summer, we can.....key word..can receive good snow amounts, but North Carolina is notorious for it's crippling ice storms. 3.) I may be heading down to Bank of America Stadium to see the Panthers and the Saints. It will be a tough one, hopefully we'll pull it off. 1.) I'll do my best to get a decent fishing report posted tomorrow, but I will do a makeshift report. Fishing for trout up in the mountains will not be the best, as temperatures are expected to soar to the low to mid 80's up in the high country, so we will see the precedent 80's we saw a month ago. As long as you fish in the mornings, and up high (3,000-5,000) you should find that the fishing isn't half bad. Still, droppers are working, while green weenies, copper johns, lightning bugs, PT nymphs and so on are the targeted nymphs. Dries to offer to the fish would include #14-20 Adams, #14-18 light cahills, and small cream midges. Again, experiment with those droppers, to find that certain bug the fish agree with. 2.) Fall foliage is really shifting into gear, and the fall foliage is now really creeping down out of the mountains. Check out http://www.foliagenetwork.net/ for various foliage maps. The trees around the Charlotte area are now starting to change their color, with the colder mornings, resulting in low production of Chlorophyll in the leaves. With that being said, I'm sure the flowers will bloom and the plants will start growing once more, with these warm temps that are expected......zeesh...mother nature can't make up her mind! 1.) The Panthers are not doing to well right now. Tampa Bay is a very talented team, and for some reason, the Panthers look like they are somewhere else right now. I will post the final score when the game ends. UNC Tar Heels won last night against Notre Dame 29-24, so good news there. I sure do hope the Panthers can pull another win today...I really hate to see them lose. 2.) Weather has been fantastic this weekend, as temperatures are in the 70's across the Tar Heel State. The next few days will be in the low 80's, so it will be warm, but if you target the streams at or above 2,500, you should be fine. Still, those green weenies, copper johns, and caddis larvae patterns have been the ticket here in the Southern Appalachians. 3.) Montana, Wyoming and Idaho have been dumped upon with snow over the last 72 hours. Billings has recieved 22 inches, and the snow still isn't completly over. Get this, Red Lodge, Montana, about 15 miles northwest of Yellowstone, has already received 42 inches!! In Flesher Pass, 35 miles outside Helena, the snow is 52 inches deep. Ennis has received about 9-11 inches, and 3-6 is expected tonight. It won't be long before the constant cold and snow moves in and Montanans are forced to start using their snowmobiles to get around town, instead of their car (most Montanans have big 4x4 Dodges, but....). 1.) First off, the rain we received Wednesday-Thursday was great. Unfortunately, the streams are already back to the low levels they were at prior to the rain. I just looked at the USGS real time water levels, and the "D" was at approximately 78 cfs early yesterday morning, know it's at 29 cfs. This is certainly an example of how quickly a stream can rise to average, and then descend back to record lows again. The NC mountains are in need of some decent rain, because they are still in an extreme drought. Part of the problem is that the rain falls and flows down the mountain, not giving the ground a chance to absorb enough. Here in the Piedmont, our drought is not half is bad, as we are in a moderate to abnormally dry status. Here in the rolling hills, the rain has more time to absorb. If only our temperatures were cool enough to support trout......or if we had a dam over Rocky River, that would produce cold water. I have studied Table Rock's Trout Unlimited Chapter, and they are discussing the thought of turning the Catawba River into a Blue Ribbon Tailwater that would support a healthy brown trout population. TU is going to improve tributaries, including Muddy Creek's silt deposit into the Catawba, which would greatly improve the water clarity and insect life needed for a trout river. Also, a dam that would release cold water in the Summer months would be needed. Correct me if I'm wrong, but I think the project would occur above and a few miles below Lake James. 2.) Fishing shouldn't be a drag, given the temperatures and the sunny weather, but with the water levels the way they are, you may have to work a little bit harder to entice these wily trout. Still, green weenies, copper johns, PT nymphs, caddis larvae and even girdle bugs will produce a few. Dries to have in your box would include Light Cahills, Adams, Caddis, Royal Wulffs, Trudes, and other attractors. Like always, use a dry-dropper technique, to find that fly the fish want. Since rain wasn't overly impressive, stick with the usual 6x tippet. 3.) Carolina Panthers play Sunday @ Tampa Bay. The Bucs are a well trained, well coached team, and the Panthers are a well trained and well coached team, so who knows which team will win this game. Of course I've got my fingers crossed for the Panthers, but it still is hard to tell..... the anticipation is eating me alive!!! 4.) BIG race is tomorrow here at Lowe's Motor Speedway, so my town is full of NASCAR fans. Come tomorrow afternoon, Kannapolis will be deserted, because everyone will be at the race. The roads are already backed up for miles with cars and RVs. 1.) The rain is starting to taper off as the day carries on. Some places received an inch and a half, some places received only about .15 inches of rain. I know the mountains got enough precipitation to raise some stream levels to average, but about a day or two from now, they will be back to the low water levels they were at prior to the rain. The Davidson River at Brevard is at 38 cfs, so nothing substantial, but it's better than nothing. The Tuckasegee is at 580 cfs, and the average is at 955 cfs. The larger rivers are rumored to be fishing very well right now. Those Rivers include the Tuck, Hiwassee, Holston, Clinch, French Broad, and Watauga. If you get to the stream and the water is high and muddy, put on some heavy tippet, and tie on a big gaudy streamer and hang on. If I were you, I would go and fish the Boone Fork up on the Parkway in Boone, to see some fall foliage. Speaking of Fall foliage, the peak up in the higher elevations (4,500-6,600) should see the peak in the next 3-6 days. After that, the color creeps down the mountain and eventually into the lower elevations. Saturday looks spectacular for a day of angling up in the high country as temps will range from the upper 60's to the low 70's, with sunny skies. Try Copper Johns, green weenies, PT nymphs, and so on. Experiment with your flies to nail that specific one the trout want. Fishing this evening, there may be some BWO activity, with the cloud cover today. 2.) Accuweather's 15 day forecast is calling for low 30's and mid to upper 50's on the 22nd and 23 here in Kannapolis. I'm ready for it. 1.) Sorry about the late post, I have been out and about, and have not had the time to post. With that being said, rain is coming down, and is going to be heavy at times here in the Southern Piedmont. I will post a CoCoRaHS (Community Collaborative Rain, Hail & Snow Network) post when the rain ends sometime tomorrow or Saturday. We have had some much needed rain here in the state of NC, and to tell you the truth, I'm glad we did, because the trout streams were dropping like a rock. Currently at the "D" they are at 54 cfs, with an average of 94 cfs. We are slowly getting there. In fact the Davidson has risen from 35 cfs to 54 cfs in the last hour and a half. Since the "D" is a spring creek, it won't become muddy at all. If anything, it will become a little stained, which is enough to give that 5x a try. Use streamers like Zonkers and Clouser's, and you should haul a few in. Also, check the List of flies for October to your right. More good news is that the water temperatures are great, and the trout are active. 2.) I'm ready to get the Winter season rolling. For me Winter means fly tying, and checking, repairing, and organizing my fly fishing gear. It also means tracking Winter Storms, which looks to be a major topic this Winter here in the Charlotte area, judging by Mr. Bastardi's Winter forecast, in my last post below, from Accuweather.com. Take a look, it sure is exciting for us snow lovers. 3.) I may post sometime in the morning, between 8 and 9:15, it depends..........zzzzzzzzzzzzz........probably in the afternoon. 4.) Make it a good night and good Thursday. 1.) Here in the Charlotte area, it is in the low 70's and the sun is hidden by sporadic cloud cover. Rain is forecasted to move into the area around noon, and up in the mountains, by as early as mid morning. This is excellent news for the trout and fly fisherman, because it there hasn't been a decent, soaking rain here in NC for a few weeks. 2.) Tomorrow will bring the chance for you to tie on that streamer, and use possibly 3x and 4x tippet, and catch that big guy that is to smart for us fisherman. If you are lucky, you may see a few olives hatching, depending on when the clouds and damp weather moves in. People have mentioned that Green Weenies have been working very well right know. Copper Johns and PT nymphs will produce a few strikes. As for dries, I would use #14-22 Adams, with a small beadhead as a dropper. This will show you which fly the trout would rather take. When the rain starts, and the river starts it's ascent, use streamers and big back stoneflies. Sculpins may also be a good fly to use. Experiment with different flies, and narrow your selection down to the most likely insect the fish are feeding on at that time. Water may rise very quickly if there is a downpour upstream tomorrow through Friday. I remember fishing the Nantahala River over in Robbinsville, NC one morning, and while I was putting my waders on, and exchanging an old leader with a new leader, I noticed the water levels where low, and not intimidating at all. I walked over to the bank, and watched for any rising fish, or any fish for that matter. I noticed that the rocks I was planning to stand on were gradually disappearing under about a foot of water in as little as a minute. The calm, shallow riffle on the far side of the river went from a shallow riffle, to a class III rapid. Shortly after rafts started floating down the river, and we decided to head upstream, and fish above the put ins, where the rafts originated from. I new the trout were refusing those big, yellow things, and if they were not, I didn't have any yellow raft flies on hand. Anywho, I fished in the extreme headwaters of the Nantahala, and found that there were no rafts, and a lot of 9-13 inch trout under the rhododendrons. I immediately observed a small, but truculent little brown trout eating small light cahills, (which looked to be about a size 16). So, I tied a light cahill on and dropped it about 4 feet in front of the him. He ignored it at first, but eventually he couldn't take it any more, and he grabbed my fly once it was about a foot past him. Little things like this, are like adding wood to a fire. It isn't going to fade away until you stop learning and enjoying the sport. 3.) More later....make it a good day. 1.) Today is Monday, which for me means, "how long until the weekend"? Fridays are my favorite, because you know you have 2 more days until the start of the work week. Also weekends mean fishing. With that being said after watching the Carolina Panthers shut out KC 34-0, today is better than most days. 2.) There is good news and bad news for us fly fisherman. The good news is that rain is looking promising for Wednesday-Saturday. There is a 40% chance on Wednesday, with a 60% chance on Thursday, as well as a 30% chance for both Friday and Saturday. This is for the Asheville area, so not everybody will have equal chances for rain. The bad news is that the water flows are very low. Until we get more rain, fishing will be tough. Using 6x tippet, and small flies will be to your advantage. Don't be afraid to crawl on your knees prior to fishing. This will greatly reduce the number of fish spooked. Since the temperatures are warm (76-80), give a small light cahill (#16-18) a try. Copper Johns (any color) will work in sizes of 14-20. Isonchia patterns (Adams)(dry/nymph) are good choices to fish with. If we do get rain, and the rivers start to come up, try big streamers like a Bunny or a Matuka. If you fish today or even tomorrow, with the warmth that has settled into the Carolinas, a grasshopper pattern may still get a few trout to chase after it. Even though the frost that the mountains experienced last week, probably killed most of the hoppers, a few spots that managed to stay just above freezing helped to keep the grasshoppers around. On your way to the stream, walk around the banks and if you see a few of them jump, then tie on a Dave's or a Jacklin's, or even a Double Decker and have at it. Just keep in consideration, every valley, mountain side and stream will frost in the coming weeks. If you fish today or tomorrow, you may not see another angler. The Davidson will probably have a few locals fishing, but you should have a whole beat or two to yourself, and the worry of fly casting elbow to elbow is not a problem right now until the weekend. 3.) I have been tying a lot of Copper Johns lately. For some reason I don't tie a whole fly box full of John Barr's famous pattern. I've used the Copper John a few times, and frankly, after watching the trout look at the fly, refuse it, and then chase back after it and nail it, I am now going to fill my box with these things. I think the chartreuse and red ones work the best, but this is my personal opinion. I'm also coming up with some new nymph and dry fly patterns that I will do a demonstration on at Troutfest. 4.) More later. Make it a good day. 1.) Currently here in the Charlotte area, it is in the mid 70's, with partly cloudy skies. The warm weather will be hanging around until next Tuesday, when temperatures come down a few degrees to the low 70's. Rain may be on it's way on October 13th. That Monday, which is about a week and a half away, shows a 60% chance for rain for both the Piedmont and the mountains of NC. This is great news, because the mountains are still under an extreme drought, and any rain we can get would be excellent. This Thursday and Friday, we may get a little rain also, with a 40% chance on both days. The water temps are ideal for the trout this time of year. I checked out the USGS real-time streamflow data, and what caught my attention was the water flow of the Jacob Fork River in South Mountains State Park. Currently the Jacob Fork is at only 9.1 cfs, with the average being at 56. This is a 46.9 deficit from average flows; the river is relying on groundwater levels, which isn't much better either. I like to fish the Jacob Fork in the Winter, and early Spring, because it seems as if this is the only time the water is up, and during that time 15 fish days where the norm for us fisherman. The Henry Fork is better, but not overly impressive. The Davidson River is way down, with a flow of 25 cfs and an average level of 121 cfs. All of the fly shops will say the water is low, but if you can fish low water comfortably, then by all means go for it. When the water is this low and this clear, the big brown trout sitting in their feeding lane, half out of water, will see you first. You just have to do what you can to make the trout feel less threatened. Small tippets, small flies, and careful wading techniques will make the possibility of hooking a fish a definite maybe. Sticking to the tailwaters in Tennessee may be your best bet. Try the Watauga, Clinch, Holston, or even the Nolichucky for smallmouths. 2.) When you fish this time of year, and then again in the Spring when the rainbows start spawning, please watch where your feet land on the riverbed. The trout have established redds and stepping on them will almost instantly kill the young trout, in return not helping with the fish populations. The trout will be in and out of small tributaries of the river, so be careful here to. If you can, try and stay on the banks, and out of the water. This will help protect the redds, and also will cross out spooking the fish with wakes and stirred up water. 1.) It was once again, a very chilly start to a Friday here in the Tar Heel State. The official high was 45 here in the Concord/Kannapolis areas, but I'm not convinced that we hit just 45. I checked the temperature at 7 AM and it was 42. Up in the mountains, a good formula to find their temps, is to take away 7-10 degrees from Charlotte's temp and that is a good general way to get say, Boone's or Asheville's temperatures. From what I heard, the protected valleys up in the mountains briefly reached the freezing mark, and in other spots, some reached a degree or two below freezing! If we are hitting the 32 degree mark this early, Winter might be a good year for us snow and cold lovers. The saying "cold weather will turn to warm weather" will happen this weekend, as we will be up in the upper 70's and low 80's. 2.) Fishing is not the best right now because of the low water levels. If you find a spot, where the water levels are giving the trout a break, by all means have at it. Fish along the seams, in the riffles, and runs, and you should catch a couple. The trout will take a # 16-20 BWO nymph, # 16-20 Copper John, as well as small green caddis patterns. Any small nymph in sizes 14-24 should make the fish at least turn around and look at it. Stay low and use light tippets and you should be fine. The 10 day forecast isn't calling for much if any rain over those 10 days. 3.) Panthers play on Sunday at 1:00 against the Kansas City Chiefs. I really don't have any idea as to who will win. The Panthers can be very unpredictable, but they should leave with a win. Jordan Gross is not going to play on Sunday, which is a tremendous loss. Tackle Jordan Gross will not play versus Kansas City after suffering a concussion last week, ending his streak of 84 consecutive games started, the second-longest in team history. "It's (injuries) part of the league; it's part of the game," head coach John Fox said. "We've dealt with it before; we'll deal with it again." The Panthers options to start at left tackle include Frank Omiyale, who would be making his first NFL start, or Travelle Wharton, who replaced Gross following his injury against Atlanta. 1.) Cold temperatures this morning greeted all of us here in the Piedmont. The official temperature for Charlotte early this morning was 42. It looks as if we may hit at least 45 tonight, if not lower than that (42-44). It is time to take out those jackets, and dust off those waders, because temps are changing rapidly. The mountains are expected to make it to the lower 30's tonight. Frost, I know, frost-(the first of the season, by the way) is supposed to settle into the mountains tonight. The worst frost will of course hit the highest of elevations, so not everyone will have to defrost their windows. This will definately wipe out the grasshoppers, and terrestrials up in the high country, so it is about time to put those terrestrial patterns up until next Summer. Below is a weather message from the NWS in Greenville-Spartanburg. LOCATIONS COULD BRIEFLY REACH FREEZING AROUND SUNRISE. 2.) The trout are loving this cold weather, but they aren't to pleased with the low water flows, which are still WAY down. WE NEED RAIN!!! Maybe we need to try a different rain dance, because this one doesn't seem to be doing anything. Anyway, like I said above in section 1, the frost up in the mountains will probably kill most of the grasshoppers, so really us fly fisherman will have to stick with small nymphs and maybe, a BWO hatch on a cloudy dreary day, (which judging by the 10 day forecast, this doesn't seem logical.) When fishing, think PT nymphs and BWO nymphs, and you should get into some fair fishing. 1.) It is going to be a chilly one here in the Piedmont of NC. 47 looks like a low for tonight, and 44 tomorrow night. I know the people out west are rolling their eyes at us... "(44? That's a normal high this time of year here in Colorado.)" I guess after a long, dry, hot Summer, the thought of 44 replacing 95 takes some time to get use to. Speaking of the cold, I have reviewed many sources on the climate outlook for the US. Most forecasters are saying we may have a good year for snow and cold here in the western Carolinas. Even though it's just an outlook based on previous years, it still usually turns out to be surprisingly correct. It's amazing what meteorologists can predict. 2.) Still, there is not really a change in trout fishing right, other than a loss of a few cubic feet of water in most rivers here in the state from yesterday's flows. We are currently in dire need of rain here in NC. The rivers are dropping like a rock, and the fish are just building up their skittish nature, one cubic foot at a time. Fishing the faster pocket water, and riffles will most likely bring some fish to your net. All you need to do is stay low wear drab colored clothing, and use extreme caution when walking in and along the river. Mend your line, and use the smallest strike indicator your fly will will allow. Check out the list of recommended flies for October, over in the right hand column, for fly selection. Most streams will be free of a crowd of anglers, (especially on the weekdays) although, the "D" may have a few fisherman. This will change in approximately 2 weeks when everybody flocks to the streams due to the Fall colors. Anywho, more tomorrow.....Stay warm these next couple of nights.